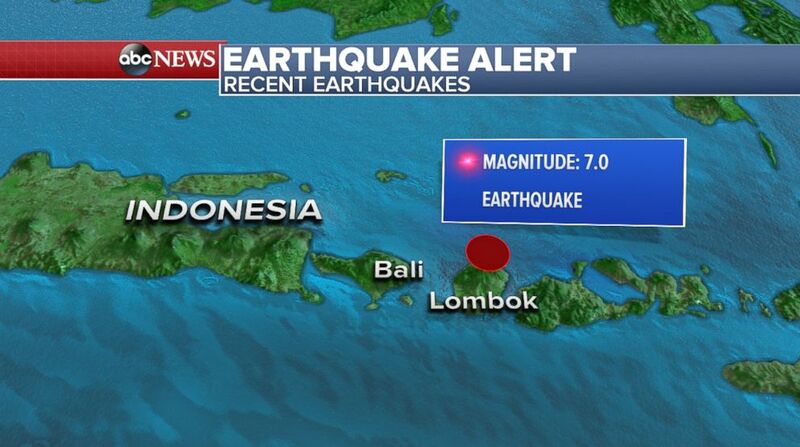 The earthquake struck off the coast of Lombok island on Sunday. At least 91 people are dead and hundreds more injured as a magnitude 7.0 earthquake rocked Indonesia's popular island of Lombok on Sunday, according to Indonesian authorities and the U.S. Geological Survey. The island is popular with tourists and now about 1,000 foreign visitors have been evacuated to nearby islands. The powerful quake struck at a relatively shallow depth of 10.5 kilometers off the north coast of Lombok, a little over a mile from Loloan village, on Sunday night local time, the USGS said. It was the second deadly quake to hit the island in a week. 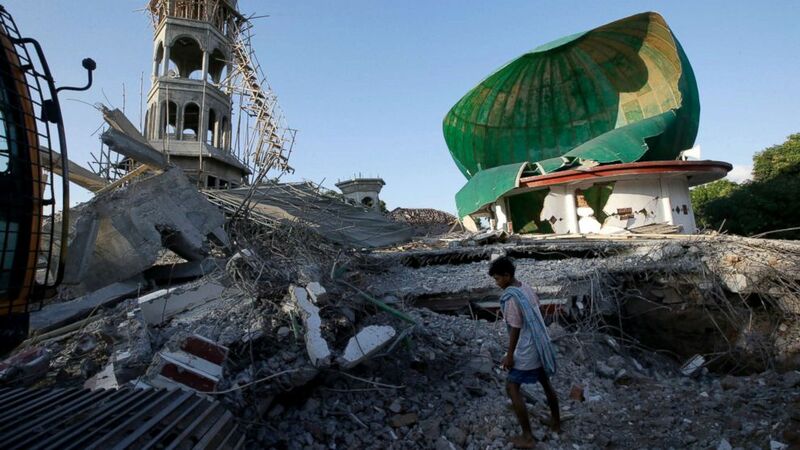 (Tatan Syuflana/AP) A resident inspects a mosque damaged by an earthquake in North Lombok, Indonesia, Aug. 7, 2018. Thousands left homeless by the powerful quake that ruptured roads and flattened buildings on the Indonesian tourist island of Lombok sheltered Monday night in makeshift tents as authorities said rescuers hadn't yet reached all devastated areas. The country's National Board for Disaster Management said Monday that 91 people died and 209 people were injured in the quake. Thousands more people were displaced as thousands of buildings were destroyed. The agency warned all of the numbers were likely to increase as search operations continued Monday. As of Sunday evening local time, there were 47 aftershocks with smaller earthquake intensity, according to the National Board of Disaster Management. Despite its popularity with tourists, officials said everyone who died was an Indonesian citizen. They said most of those who died were struck by falling debris from collapsed buildings. (AP) A man cleans up at a building damaged by an earthquake in Bali, Indonesia, Monday, Aug. 6, 2018. The National Board for Disaster Management said that people panicked and scattered in the streets at the impact of the earthquake. When they did that, nearby buildings that had been damaged the earthquake that hit earlier that week became even more damaged and collapsed. Seventy-two of the people who were killed were in North Lombok, which was hardest hit by the quake. (ABC News) A magnitude 7.0 struck off the north coast of Indonesia's Lombok island, Aug. 5, 2018. The Indonesian Army has sent three C-130 cargo planes to bring food, medical supplies, tents and communication equipment to the thousands of refugees affected by the disaster. The National Board of Disaster Management said there was an urgent need for ready-to-eat food, mineral water, blankets, clothes and other basic necessities. Indonesia's agency for meteorology, climatology and geophysics issued a tsunami warning just minutes after the earthquake hit. The agency later declared the warning over. 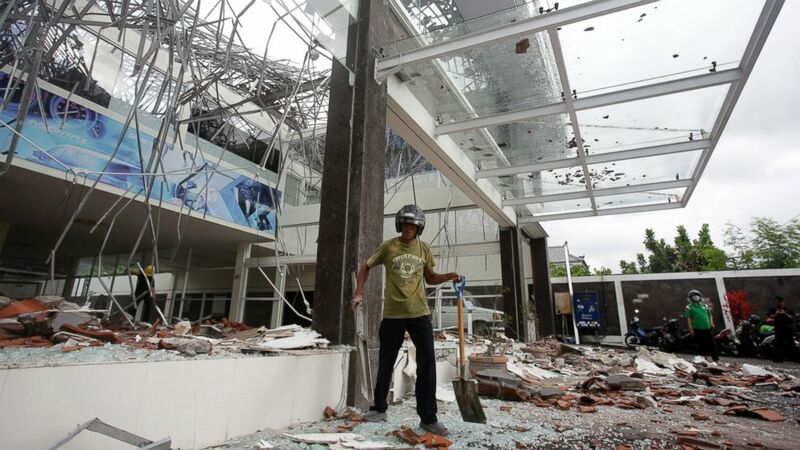 A 6.4-magnitude earthquake struck the same region on July 29, which caused some damage, the nation's officials said. The quake on Sunday exacerbated those problems. 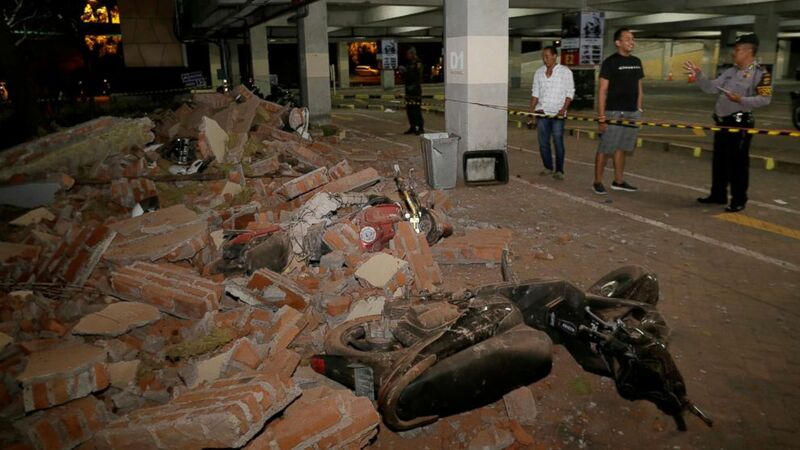 (Johannes P. Christo/Reuters) A policeman examines debris that fell and crushed parked motorbikes following a strong earthquake on nearby Lombok island, at a shopping center in Kuta, Bali, Indonesia, Aug. 5, 2018. Many people in the area, including American model Chrissy Teigen, took to Twitter to say they felt shaking and trembling. Teigen has been vacationing in Bali with her husband, musician John Legend, and their two young children, Luna and Miles. "Bali. Trembling. So long," Teigen tweeted Sunday. "So many aftershocks," she tweeted again. The National Board for Disaster Management said two people died in Bali. Earthquakes are common in Indonesia, which is situated on the Pacific Ring of Fire, a seismically active hotspot encircling the Pacific Ocean. In late 2004, a magnitude 9.1 earthquake off the island of Sumatra triggered a tsunami that killed hundreds of thousands of people in various nations around the Indian Ocean.